for the United States, Europe, Middle East and Africa. 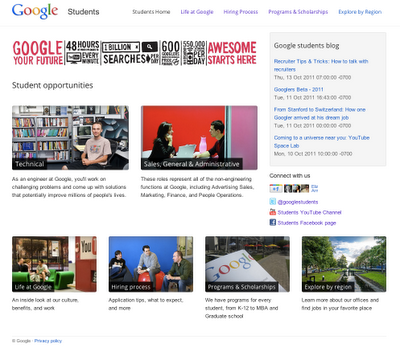 With the new site layout, we hope to make navigating for job opportunities at Google easier and more intuitive. You can begin your search by selecting your area of interest: technical or sales, general & administrative. You can then select whether you’re interested in full-time roles or internships. Lastly, you can choose your region, or a region where you’d be interested in working. We believe that this process will be much more effective for students, who can now quickly see available opportunities of interest to them. There’s also more information on the hiring process, programs and scholarships, and what life is like at Google. We hope you like the improvements we’ve made and encourage you to take a look around. Today we launched a new version of our student job site for the United States, Europe, Middle East and Africa. With the new site layout, we hope to make navigating for job opportunities at Google easier and more intuitive. You can begin your search by selecting your area of interest: technical or sales, general & administrative. You can then select whether you’re interested in full-time roles or internships. Lastly, you can choose your region, or a region where you’d be interested in working. We believe that this process will be much more effective for students, who can now quickly see available opportunities of interest to them. Looks great David et al.! Thanks for all of the invaluable information that you provide here. It has been a "must read" in my Google Reader for some time now! 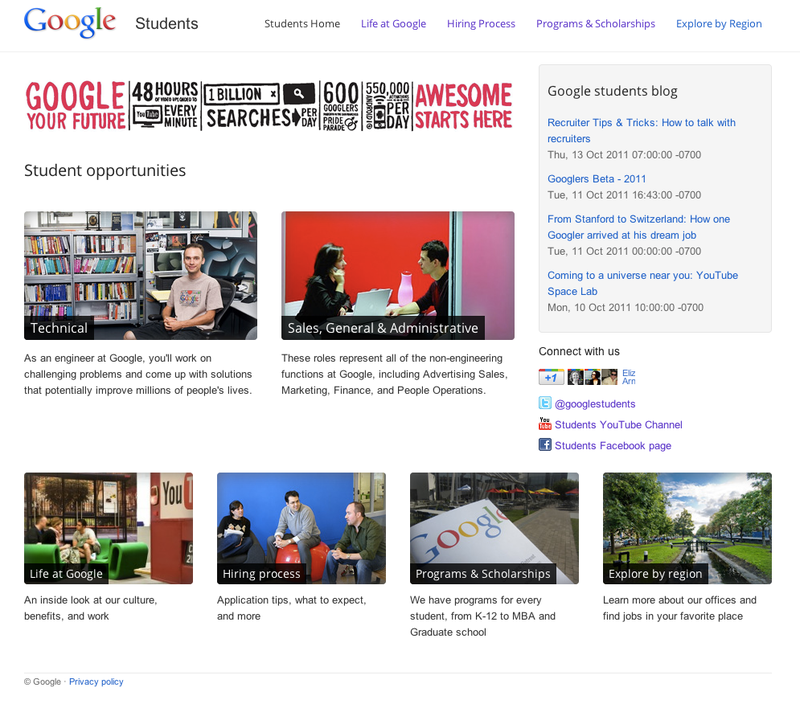 It's really Great but I wanna add Google Adsense should be a chance for earn money for student. Thanks for such a nice direction.